Get creative and display your vision with our handy do-it-yourself option. At Tailor Maid Events, we offer a decoration hire service that includes beautiful centrepieces and bespoke hard to find items, such as sparkling confetti. You don’t have to worry about being left in the dark, as our friendly staff are always on hand to advise you as to how to lay out the items. Wishing trees are a popular accessory, ours are responsibly sourced from an exclusive supplier. Should you require any guidance or assistance, our team will be on hand to provide support. Ensure you party is sparkling with our pristine, high-quality decorations. As we take pride in our business, we always ensure our decorations are spotless and replenish stock regularly. Our dedicated staff ensure our fabrics are of the finest quality, including hotel linen and spandex Lycra chair covers. Our chair covers are stunning and are engineered to fit most styles of seating. Our DIY option allows you to save money and have a fantastic time creating quality memories. The DIY service is very affordable, we only require a small holding deposit to ensure items are returned in a good condition. In the unlikely event that any damage should occur during your event, this will be taken from the deposit. 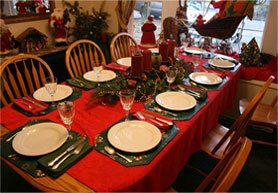 Clients collect the decorations from us, and return them once the party has finished. In addition, we request that clients provide their own transport for items. You don’t have to worry about returning the items immediately, as we allow clients to keep them for a few days or more, depending on their requirements. Don’t forget to add something sweet with our confectionery option. 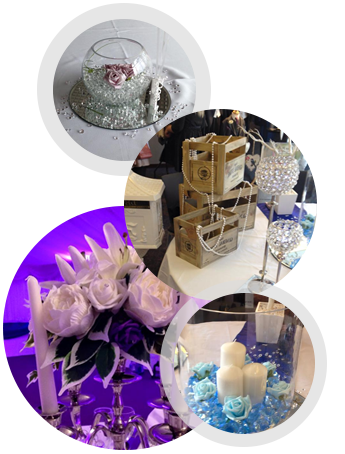 Contact us to find out more about our stylish centrepieces and decoration hire services.